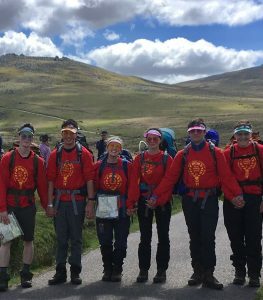 Wow, what an absolutely amazing event Ten Tors 2018 was! The sun shone bright as the exhausted Young People crossed the finish line as the Training Team, Families and the massive crowd cheered and congratulated them, seeing the strength and resilience in these youngsters fills me with pride and i’m not ashamed to say that a tear or two might have been present. After checking in with the Army and their Team Managers the participants were awarded their medals and after a lot of photographs were off for their much deserved Pasty. Back at camp they were greeted with more cheers and a big tray of cake and were finally able to sit and relax, after months of training they had achieved what they had set out to do and can now rest and be proud of their accomplishment. The Training Team would like to congratulate each of the Participants and say a massive well done, we look forward to seeing you all at the BBQ on the 9th Jun.